For some reason lately, I’ve been drifting away from greasy burgers and going more for a sandwich. Most nights at work, I hit up the deli at Martha’s Vineyard in Grand Rapids for a pretty simple, but extraordinary Pastrmi sandwich. I’ve just been on more of a sandwich kick lately. A few weeks ago, I got a press release about a new sandwich place opening up downtown. When J got home from work last Monday, I asked if she wanted to make a quick trip to pick up a few of these new creations. 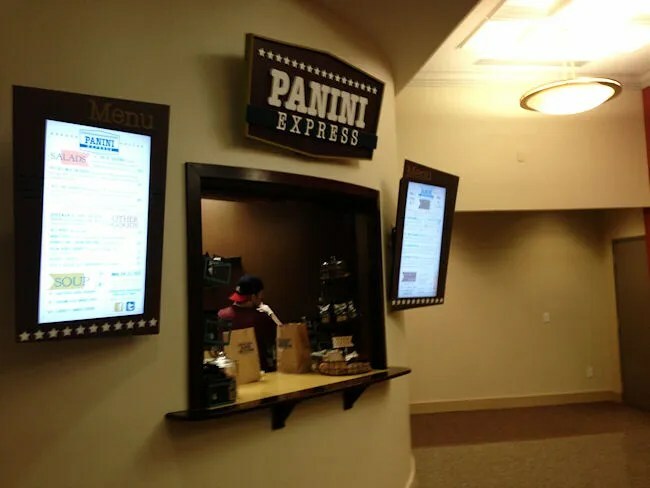 Panini Express is brought to you buy the same people responsible for some of Kalamazoo’s great restaurants. The Union, Epic Bistro, Central City Tap House, Fieldstone Grill, Martel’s, The Wine Loft, and now Panini Express. They all fall under the Millennium Restaurant umbrella. The newest addition is a pretty small joint. Heck, it’s really just a window inside the City Centre that is attached to The Union. There’s no seating or anything. You just kind of order from the hallway. The window cut out is flanked by digital menu boards. The tricky thing is, the menu changes every day. They post it daily on Facebook, Twitter, and their website….so don’t get too attached to one sandwich. J and I walked up to order sometime after 1:30, but before the 2:00 closing time. There were two guys working in the small kitchen. One took the order. One prepared the sandwiches. As we were waiting for the sandwiches to be grilled, L, who was in my arms, was desperately reaching for an orange that was in a basket on the counter. We kept telling her we’d get her an orange when we got home, but the guy cooking picked the orange up and gave it to her. He said if the baby wants an orange, she can have it. Yes, I tipped him well after that incredibly nice gesture. As for J and I, I went with a full sandwich while J took advantage of the 1/2 sandwich and a salad. The sandwich I chose on this particular day was called the Dearborner. 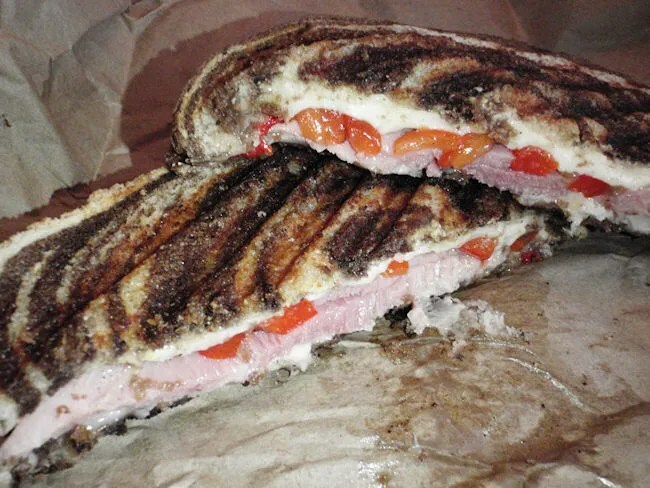 It is two thick slices of Dearborn ham on rye swirl bread with two thick slices of Swiss cheese, fire roasted sweet peppers, and Gulden’s mustard. The sandwiches are pre made and pressed fresh when they’re ordered. Even though we had a 10 minute drive back home, the sandwich was still plenty warm and delicious. The thick slices of swiss added a very gooey layer. The mustard was just slightly spicy which was countered by the sweet peppers. J’s selection was a sandwich called the Mediterranean Turkey. 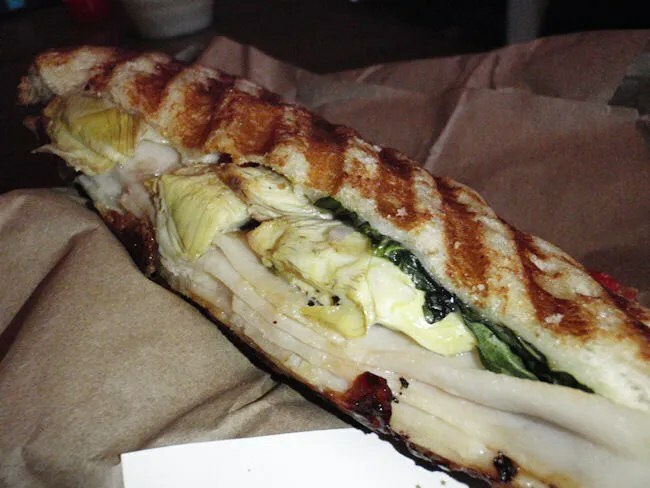 The sourdough bread contains roasted turkey, two thick slices of Asiago cheese, roasted artichokes, roasted red peppers, baby spinach, and a roasted garlic cream cheese. She said the sandwich was delicious. She only got a half though because she opted to go with a salad. The salad was called the Jr. Gardener. The menu lists the lettuce as romaine, but it was more mixed greens and J really liked that. She isn’t a huge fan of what most of us call lettuce…she much prefers the mixed greens. 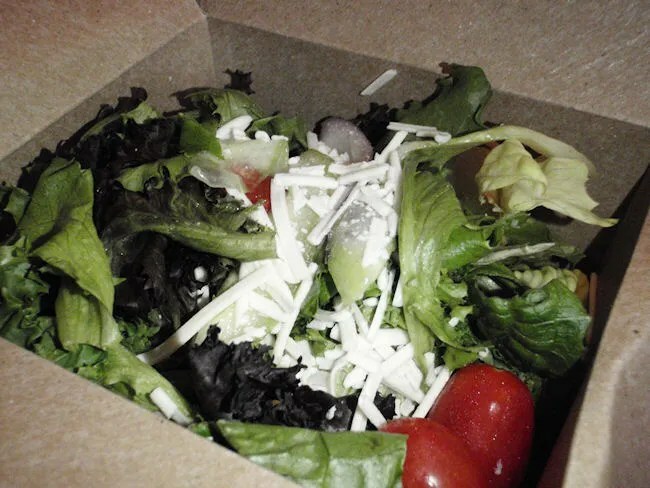 The lettuce is topped with red pepper, cucumber, red onion, asiago cheese, and tomatoes. Panini Express is a great lunch time option in downtown Kalamazoo. The ever changing menu will keep people coming back. It really doesn’t matter what ends up on the menu because everything is quality. The big thing is Panini Express hits the big issues when it comes to lunch time foods. It’s quick. It’s cheap. Most importantly, it’s delicious.